"There can be little doubt that this already well known image is a career highlight. It is unquestionably the most warmly received photograph that I have taken - so much so that the limited edition prints are nearly sold out within six weeks of capture. Manifestly, we have been able to do very little to stagger demand, including raising the price. It is what it is and the art market is exactly that - a market." I still get goosebumps just looking at a big print. Tim is the world’s most famous big tusker - and our big Los Angeles prints have never been more necessary - why diminish Tim in print when we can surely glorify his magnificence? To find him in the open in the foothills of Kilimanjaro offered a lucky opportunity and we took it to the full. 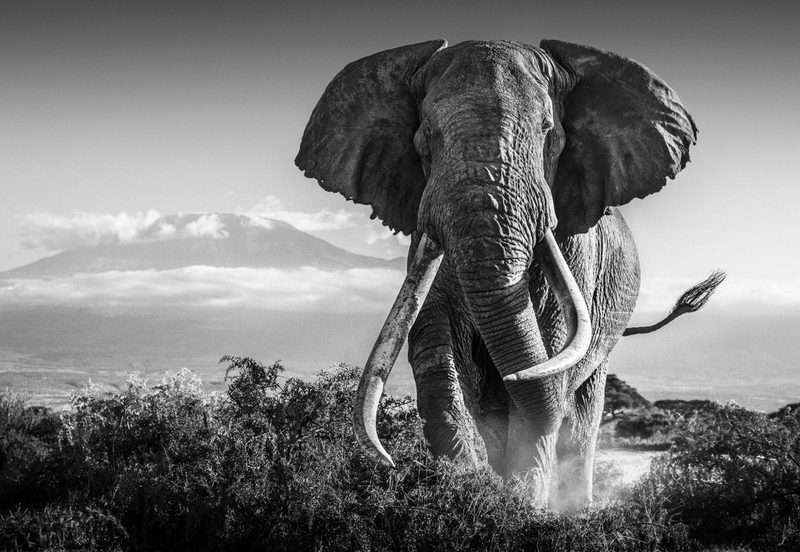 I will always treasure this image and I doubt I will ever take a more powerful portrait of either an elephant or East Africa. That’s the thing about this work - it’s a collision of two enormous features - one volcanic, one iconic and they complement each other and raise the bar higher still. It’s a timeless piece and closer to perfection than anything I can remember in my career. The contextual narrative behind Tim is East Africa at its symbolic best. We felt we could get away with calling the image “Africa”. It’s a dangerous title for sure, if the product is not extraordinarily special. The irony is that three hours prior to taking this image, I was sitting back at our base somewhat grumpy that for once the location was not delivering. Indeed, I was considering leaving early, as time is money and this did not appear to be our trip. But at 2.20pm, just before our flights were rescheduled, we received the news that our scouts had located Tim in the open, 90 minutes away and there was a chance to do what I had always wanted to do. We grabbed our gear and made haste. When we arrived the sun was still too high and we had to bide our time and keep our distance from Tim. I wanted a fresh charge not a tired one and that meant waiting and playing smart. We had to keep him at distance, but equally keep him in our sights. It was a tactical hour ahead and there were many people to thank for keeping their discipline and encouraging me to keep mine. The greatest credit for this piece of art should go not to me, but to Juma Wanyama, my local guide for the last eight years in Amboseli. He found and incentivised the scouts that tracked Tim, but more importantly, he knows both this elephant and me equally well and he allowed me to put myself potentially in harm’s way. Had our relationship been nascent, there is no way this picture could have been captured, because at its heart there is a triangular trust between three mammals. I have had to earn that with Juma and Juma has certainly had to earn it with Tim. It is this simple dynamic that is the secret to the image - trust. It was this trust that offered me the chance of a ground up perspective and that was key to the composition, as was the 58mm lens - an optical dream of a lens - and the very same lens with which I shot Mankind with in 2014. It will always be my favourite lens now - how can it not?